Bilbo and his company of cheerful dwarves try to reclaim the Lonely Mountain from the vicious and cunning dragon, Smaug. Help the dwarves and Bilbo so he can go back to his Hobbit-Hole to care take his lovely garden. 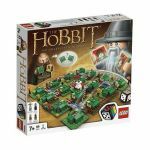 We hope you have lots of fun playing with the LEGO® The Hobbit™ sets!